Marinated feta is something that takes just a few minutes to mix together and gives you a ton of delectable ways to use it. I love always having some on hand to liven up salads, crumble over grilled veggies, top pizzas or serve simply with grilled bread & olives as an appetizer. Use the flavored oil drizzled over the same things you crumble the cheese onto for extra deliciousness. Fresh summer herbs are abundant right now so use whatever you have on hand...thyme and rosemary grow like weeds here so that’s what I used, but be creative! 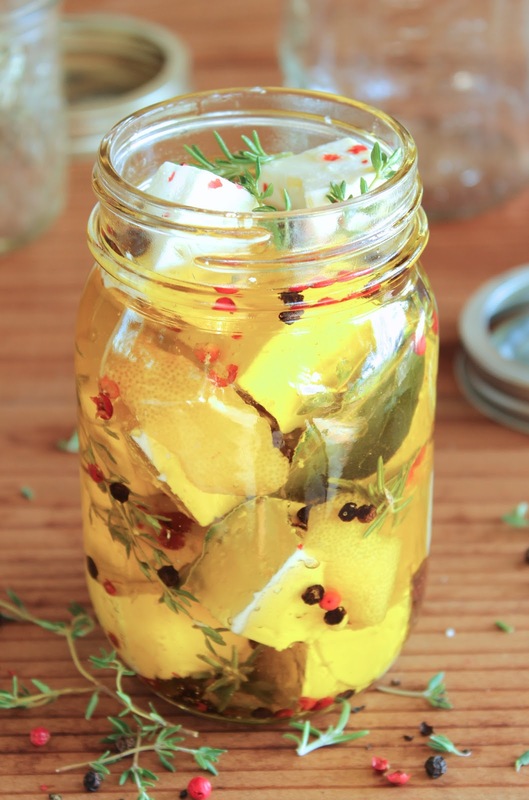 All the herbs and feta also look really cute in the mason jar and would make an amazing homemade hostess gift. Gently pound your thyme, rosemary and lemon with a mallet to release their flavors while still keeping them intact. Place a spring of thyme, a sprig of rosemary and a few peppercorns in the bottom of a clean 2-cup glass mason jar. Gently add a few cubes of feta. As you fill the jar with cheese, layer in your herbs, peppercorns, lemon zest, etc. between every few cubes so that the flavors are intermingled throughout the jar. Fill jar to the top with cheese, herbs and spices. Once full, pour in olive oil. Put on lid and give it a couple gentle shakes. Let this feta marinate in the refrigerator a couple days before you dive into it...the longer it sits, the more flavorful it is! Keep refrigerated and use within 2-3 weeks - if you can keep it around that long! Note: because the olive oil with become solid in the refrigerator, remove and let it return to room temperature for about an hour before serving.